Robert D. Leavitt, J.D., LL.M., is Of Counsel to Lowis & Gellen where he focuses his practice on general commercial, corporate and financial transactions, banking, commercial lending, and real estate. Mr. Leavitt has been practicing law for over twenty-five years, much of it in senior law department roles in major companies, including as General Counsel. Mr. Leavitt has lectured on a range of corporate and banking topics and has conducted training programs relating to the sale of goods and various loan and bank services. 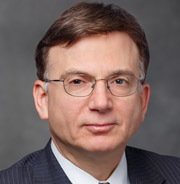 He is past chair of the Chicago Bar Association’s Pass-through Entities Subcommittee, Commercial Finance and Transactions Committee and Corporate Law Departments Committee. He received his law degree from DePaul University in 1979 and an advanced international law degree from Cambridge University in 1980. Mr. Leavitt graduated from Colgate University (B.A.) in 1976. He is admitted to practice law in the State of Illinois.